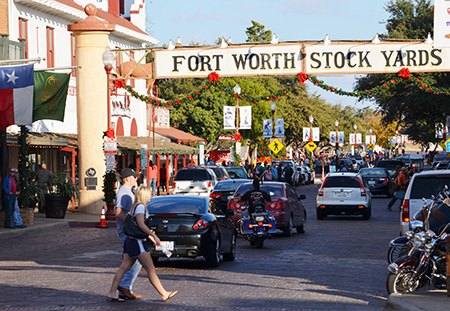 According to the Fort Worth Visitor’s bureau, the city of Fort Worth has about 1 million visitors per year and about 50% decide to visit the Fort Worth Stockyards. In a couple of my earlier blogs I have written about the Texas Long Horn cattle, Stockyards museum, and Billy Bob’s Honky Tonk, but what actually made the Fort Worth Stockyards become the cattle metropolis of the south and then what changed things and made it into what it is today? 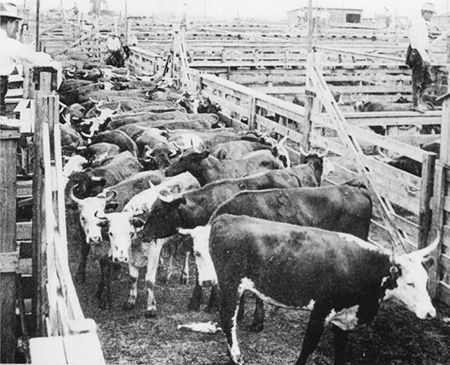 Steers and Pens at Fort Worth Stockyards, Photograph, n.d.; digital image, (http://bit.ly/12iLgyP : accessed February 02, 2013), University of North Texas Libraries, The Portal to Texas History, http://texashistory.unt.edu; crediting Tarrant County College NE, Heritage Room, Fort Worth, Texas. Fort Worth was founded about 150 years ago as an army outpost. After the Civil War drovers started herding their cattle from the south of Texas toward the Chisholm Trail via Fort Worth . However, it wasn’t until the railroad eventually reached the city in 1876  that cattle pens were starting to get built. The railroad contributed to the city’s rapid growth as shipping to other parts of the country became possible. In 1887 the Union Stockyards were planned and they became operational two years later . 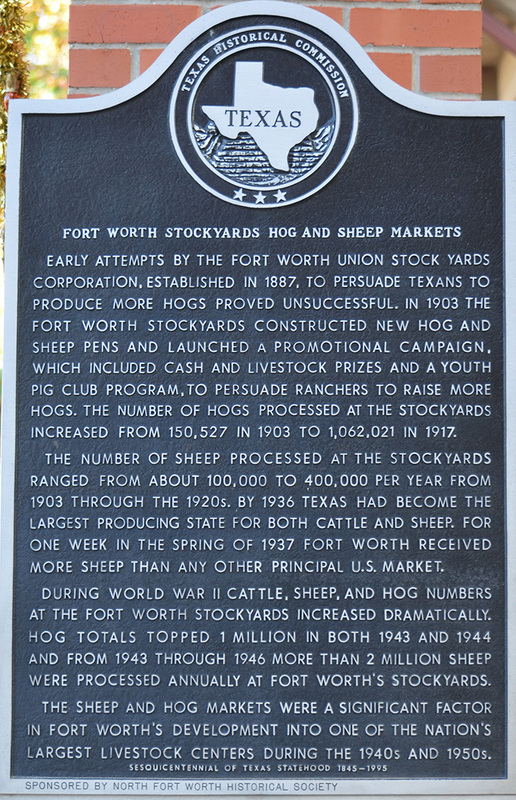 In 1893 Simpson, a Boston capitalist, bought the Union Stockyards and changed the name to the Fort Worth Stockyards Company . Soon the area changed from just shipping to a full-blown industry as meatpacking industry moved in. Armour & Company and Swift & Company being the largest ones. By 1909 “Armour and Swift bought 265,279 cattle, 128,934 hogs and 40,160 sheep, which brought over six million dollars into the local economy” . Fort Worth Stockyards in the 1930’s, Photograph, n.d.; digital image, (http://texashistory.unt.edu/ark:/67531/metapth24708/ : accessed February 02, 2013), University of North Texas Libraries, The Portal to Texas History, http://texashistory.unt.edu; crediting Tarrant County College NE, Heritage Room, Fort Worth, Texas. Left: Then – Aerial View of the Fort Worth Stockyards with Coliseum, Photograph, February 1960; digital image, (http://texashistory.unt.edu/ark:/67531/metapth43310/ : accessed February 02, 2013), University of North Texas Libraries, The Portal to Texas History, http://texashistory.unt.edu; crediting Cattle Raisers Museum, Fort Worth, Texas. Right: Now – Coliseum today. Bill Picket (1870-1932) was a Texan African American rodeo artist who went under the name The Bull Dogger. The “Greatest Cowboy” of his day, “he established The Pickett Brothers Bronco Busters and Rough Riders Association”  and performed around the country. 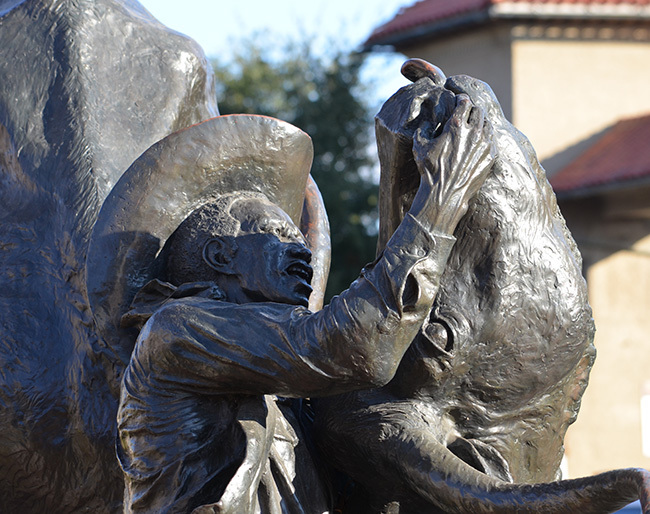 A statue of him wrestling a steer is placed outside of the Coliseum at the Stockyards. “At the height of World War I in 1917, the Fort Worth Stockyards was the largest horse and mule market in the world”  and “During World War II, the Fort Worth Stockyards processed 5,277,496 head of livestock making 1944 the peak year of the entire operation” . But there were also sheep and hogs. Following World War II the Stockyards time of decline began. Listen to Fort Worth Historian and author Janell Pate  talk about how this happened and how the Fort Worth Stockyards were saved by the local community into what it is today in the YouTube video below. As noted in the beginning, today the Forth Worth Stockyards buzzes with life as tourist explore the historical district and the culture. One of the daily highlights is the twice daily cattle drove along the main street starting 11:30 am and 4 pm. A memory of times past. The Stockyards Station is the final stop of the vintage railroad trip with the steam powered Tarantula. Weekends during late February through November visitors to Fort Worth may enjoy the train ride from Grape Vine to the Fort Worth Stockyards or vice versa. The journey takes one hour and fifteen minutes. The Fort Worth Stockyards station hosts many shops and places to eat and is located close to the visitor bureau where visitors may pick up a walking tour map and explore the area. The Fort Worth Stockyards Station. Final destination traveling on the vintage railroad on the steam powered Tarantula train from Grapevine.